The Meguiar's M21 Synthetic Sealant 2.0 provides outstanding protection from all of nature's harshest elements. This sealant benefits from technological advancements and some of the finest ingredients ever put in a Meguiar's sealant for top quality results. When you first use it you are instantly at ease with how quick it is applied. Next you notice the highly reflective shine it provides to any color paint! Over time you will really appreciate the durable protection this sealant provides your paint. Don't forget you can also apply it to your headlights, glass and wheels so they stay looking their best for longer. This protection will last for months and you'll love the way rain drops just bead up and roll off the surface. It repels moisture, industrial fall out, road grime, UV rays and so much more. This extremely well rounded sealant gives you everything you need and more! 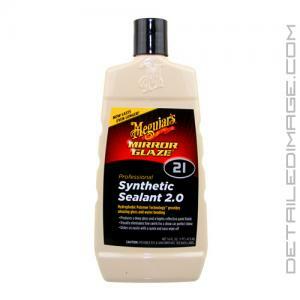 You will love this shine every time you use it, try the Meguiar's M21 Synthetic Sealant 2.0 today. Scientific breakthrough that introduces an entirely new dimension of gloss and shine. DIRECTIONS: SHAKE WELL. For best results, apply to a clean, cool surface. If finish is neglected, pre-clean with Meguiar's Detailing Clay. Apply small amount of product onto applicator or foam buffing pad and spread a thin, even coat onto painted surfaces. DO NOT APPLY TO VINYL, RUBBER OR CLOTH SURFACES. Use overlapping strokes to ensure uniform coverage. Allow product to dry thoroughly (approximately 10-15 minutes). Remove using a Meguiar's M9910 Ultimate Wipe Detailing Cloth, or any other premium quality, clean towel. Turn to a dry portion of towel for final wipe. TIPS: Use Meguiar's C2000 Detailing Clay prior to application of M21 Synthetic Sealant 2.0 to ensure a Smooth-as-Glass finish. For best results, apply product using Meguiar's DA Polisher and Meguiar's W8006 Soft Buff Foam Polishing Pad or W9006 Soft Buff Finishing Pad. For optimum results when using a rotary buffer, use a speed setting of 1,000-1,400 rpm & light pressure. To ensure product is ready for removal, quickly swipe finger across panel. If surface is clear and streak free, product is ready for removal. Good product! Easy to use with random orbital buffer and by hand on the hard to reach areas. Used two coats and the finish is amazing...I could almost shave with the mirror finish I achieved. Excellent choice for the vehicle that stays parked outside 24/7. This is my replacement from (OTC) Nu-Finish. Being synthetic it has a higher melting point and durability level then paste waxes. Clayed and applied Meguiar's Synthetic Sealant 2.0 M21 at to my 3 cars in the past few days. Sealant went on great and more importantly it came off easy. Finish on all 3 looks terrific! Now need to see how long it lasts. Definitely will use it again!